This is a syndicated feed from the NBC Olympics website. It provides shooting news and video “webcasts”. It works with current Internet Explorer and Firefox browsers, but you may have to install updated video streaming components. There are live feeds of many shooting events, some with live commentary by Lones Wigger, a past world shooting champion and Olympic Gold Medalist for Team USA. For more info on Olympic Shooting, visit NBC’s INSIDE THE SPORT page. Share the post "Latest Olympics News Video and Photos"
Katerina Emmons, representing the Czech Republic, won the first gold medal of the 2008 Beijing Olympics in the women’s 10m air rifle competition. Katie was the only woman to shoot a perfect 400 score in the qualifying round. This equaled the World Record and set a new Olympic Record. The previous Olympic Record was 399. In the finals, Katerina posted a 103.5 score, giving her a final tally of 503.5, beating the previous Olympic record of 502.0 set by China’s Du Li in 2004. It was a stellar performance by a popular champion who started shooting at age 14, tutored by her father, Petr Kurka, a double world champion in three positions. CLICK HERE for story on official Olympics website. 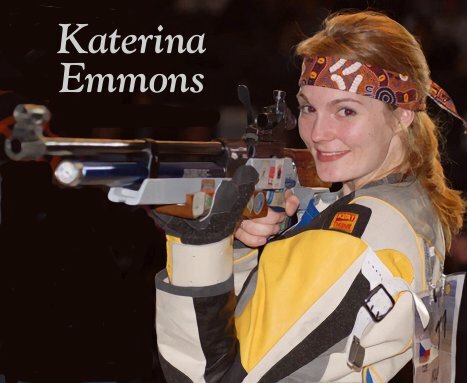 Katerina married USA Olympic shooter Matt Emmons last year. The two shooters met at the 2004 Olympics in Athens where she won her first Olympic Medal (Bronze, 10m Air Rifle) competing under her maiden name Katerina Kurkova. After winning gold in Beijing, Katerina moved to the front row of the gallery to embrace her father and then kiss husband Matt. It was a touching moment for the “First Couple” of the Olympic shooting world. “She did a fantastic job. I’m so proud of her,” Matt Emmons told Reuters. CLICK HERE for full story on how Katerina met Matt Emmons. Katerina was shooting an Anschütz compressed air rifle similar to the Anschütz model 9003 shown below. With sights mounted, a model 9003 is 42.5″ long and weighs 4.4 kg (9.68 lbs.). 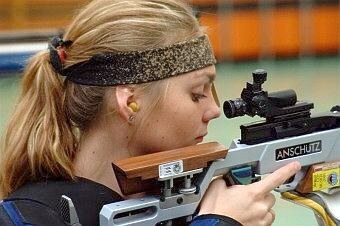 Katerina’s record-setting air rifle victory, being the first gold-medal performance of the 2008 Games, is exactly the kind of positive publicity the shooting community needs. Katerina is a perfect champion — modest, personable, and attractive. She has already become a “Cover Girl” for this Olympic games. And it is great that she is married to a fellow shooter. Hundreds of millions of TV and internet viewers worldwide were touched to see how she went to the stands to hug and kiss her husband after her shooting victory. We predict that will become one of the defining “video moments” of the 2008 Olympics. Katerina’s highly-publicized Olympic win will help counter negative perceptions about the shooting sports. It also shows that shooting is not all about strength and brawn. Her success, we hope, should insprire many young women to try shooting. A diminutive 5’5″ and 118 pounds, Katerina has proven that shooting can be a sport for everyone, regardless of size, gender, age, or nationality. We salute her achievement and we think her Gold-medal win will help increase public interest in competitive shooting worldwide. Share the post "Czech Lady Shooter Wins First Gold Medal of 2008 Olympics"